Introducing the Round Table Puzzles, the new way to do puzzles! These circular puzzles have the top of the image in the center & the bottom of the image around all the edges. Just as the Knights of the Round Table all had an equal seat around the table, everyone has an equal seat around the puzzle. The Kid’s Dinosaur Version, created by famed puzzle designer - Michael Searle, allows one to view this prehistoric moment in time including Dinosaurs of all sizes from the bottom up at every angle. 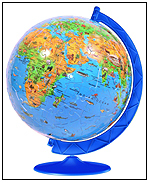 The 50 pieces are large and sturdy to enable kids to easily handle the pieces and the pieces to easily withstand the kids. Jigsaw puzzles are a timeless family tradition, but traditional puzzles present a problem to those working on them—typically only one person (the person building from the bottom of the puzzle) has a normal view of the puzzle image. The Round Table Collection now eliminates this problem. 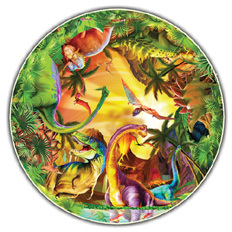 The Kid's Dinosaurs Version of the Round Table Puzzles has united a diverse group of dinosaurs in their prehistoric environment—all captured for this unique moment in time! 50 pieces.